SPoD LGBTI on IDAHOT: Of course we are in politics! Social Policies, Gender Identity and Sexual Orientation Studies Association (SPoD LGBTI) organized a cocktail with the call “Of course we are in politics” for the International Day Against Homophobia and Transphobia on 17 May. Politicians, lawyers, psychologists, and academics joined the cocktail and emphasized LGBTI rights. Social Policies, Gender Identity and Sexual Orientation Studies Association (SPoD LGBTI) organized a cocktail with the call “Of course we are in politics” for the International Day Against Homophobia and Transphobia on 17 May. The Peoples’ Democratic Party’s (HDP) Istanbul co-spokesperson Ayşe Erdem, the HDP’s Istanbul 2nd District Candidate and LGBTI Rights Pledge signatory Gülsüm Ağaoğlu, the Republican People’s Party’s (CHP) Istanbul 2nd District Candidate and LGBTI Rights Pledge signatory Gül Yüksel as well as representatives from LGBTI organizations, SPoD’s volunteer lawyers, psychologists, health-care workers, and academics joined the cocktail. In the opening remarks, SPoD’s President of the Board Volkan Yılmaz informed the guests on the association’s work and called on them to support LGBTI associations. SPoD’s Political Representation Coordinator Sezen Yalçın said the eradication of homophobia and transphobia requires a long-term struggle. Yalçın emphasized the importance of LGBTI participation in politics and informed guests about the In School, at Work, at the Parliament election campaign with the idea that “We are used to politics, politics and politicians should get used to us”. Yalçın said 33 candidates for parliament have signed the LGBTI Rights Pledge ahead of the 7 June general elections and that the signatories are increasing daily. Beşiktaş Municipality Mayorial Advisor and SPoD’s Board Member Sedef Çakmak reminded guests that very few parliamentarians were reached in the mid 2000s when LGBTI associations faced the threat of closure. She emphasized the increase in number of LGBTI rights supporters in many levels of politics and how important this win is. Istanbul 2nd District Independent Candidate Batuhan Aydagül signed the LGBTI Rights Pledge and said he will take the problems of youth facing discrimination in education due to sexual orientation and gender identity to the parliament. SPoD LGBTI’s “In school, at work, in the parliament: LGBTIs are everywhere” campaign began with the thought “You don’t have rights if you are not present!” and representatives visited the Republican People’s Party’s (CHP) Istanbul President Murat Karayalçın following their visit to the Peoples’ Democratic Party’s (HDP) Istanbul Co-Spokesperson Ayşe Erdem. Visits to the Nationalist Movement Party (MHP), Justice and Development Party (AKP), etc are to follow. Social Policies, Gender Identity and Sexual Orientation Studies Association (SPoD LGBTI) has started visiting political parties to inform them of their “In school, at work, in the parliament: LGBTIs are everywhere!” campaign which aims to make LGBTI rights visible in the general elections. SPoD LGBTI’s first visit was to the Peoples’ Democratic Party’s (HDP) where they met with Istanbul Co-Spokesperson Ayşe Erdem. Following this visit, they met the Republican People’s Party’s (CHP) Istanbul President Murat Karayalçın. SPoD LGBTI representatives aim to start a structure in the Grand National Assembly of Turkey similar to the European Parliament Intergroup on LGBTI Rights. They emphasized the importance of cooperation among CHP parliamentarians who support LGBTI rights with parliamentarians from different parties. The representatives said they would like CHP’s candidates for parliament to sign the “LGBTI Rights Agreements” and asked for Karayalçın’s support to meet candidates for parliament from Istanbul. The Political Representation Coordinator Sezen Yalçın of SPoD LGBTI, which has been working on rights violations against LGBTI since 2011, informed Karayalçın of the LGBTI in the Parliament campaign. She said they aim to strengthen the equality and freedom movement through political representation and participation for LGBTIs who are not recognized as equal citizens and whose rights to life, employment, housing, health care, and education are ignored. Yalçın talked about their work on social policy for LGBTIs equal citizenship, to ensure fundamental rights and to combat discrimination. She emphasized the importance of political advocacy for rights movements. Yalçın talked about their annual Politics School which brings together activists, politicians, and academics since 2012. Yalçın also stressed that they maintain an equal distance to all political parties and that the campaign would run independent from parties. As the general elections approach, Social Policies, Gender Identity and Sexual Orientation Studies Association has begun its “In school, at work, in the parliament: LGBTIs are everywhere!” campaign. SPoD LGBTI representatives visited the Peoples’ Democratic Party (HDP) Istanbul Municipal Branch to inform them of the campaign. SPoD LGBTI aims to make LGBTI rights visible in the 2015 general elections and its Politics School is set to begin this week. Social Policies, Gender Identity and Sexual Orientation Studies Association’s Politics School will have its first session on Saturday, 28 February 2015 in Istanbul. The Politics School, which aims to strengthen lesbian, gay, bisexual, trans, and intersex individuals in the political arena and to make LGBTI rights visible in the 2015 general elections, will run until 4 March 2015. The third annual Politics School will inform LGBTIs of political participation mechanisms, conduct presentations and workshops to encourage active political participation, and plan future political representation and participation activities. The school aims to involve participants in campaigns and monitoring for the general elections in their own cities. The subjects to be covered are: Democracy and freedoms, queer democracy, participation methods in decision-making mechanisms, civil society in law-making processes, LGBTI movement’s history and political participation, political parties and rights-based policies, gender focused budgets, LGBTI focused social policies, LGBTI rights in local politics, organizing election campaigns and election monitoring. SPoD LGBTI has started visiting political parties to inform them of their “In school, at work, in the parliament: LGBTIs are everywhere!” campaign for the general elections. 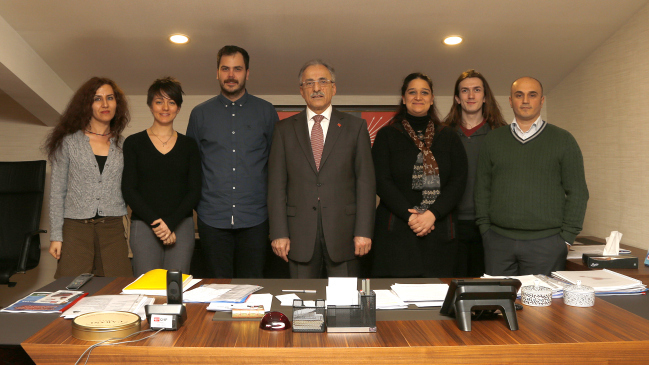 SPoD LGBTI activists conducted their first visit to the Peoples’ Democratic Party (HDP) and met with HDP’s Istanbul Co-President Ayşe Erdem. The meeting took place in the party’s Beyoğlu headquarters. 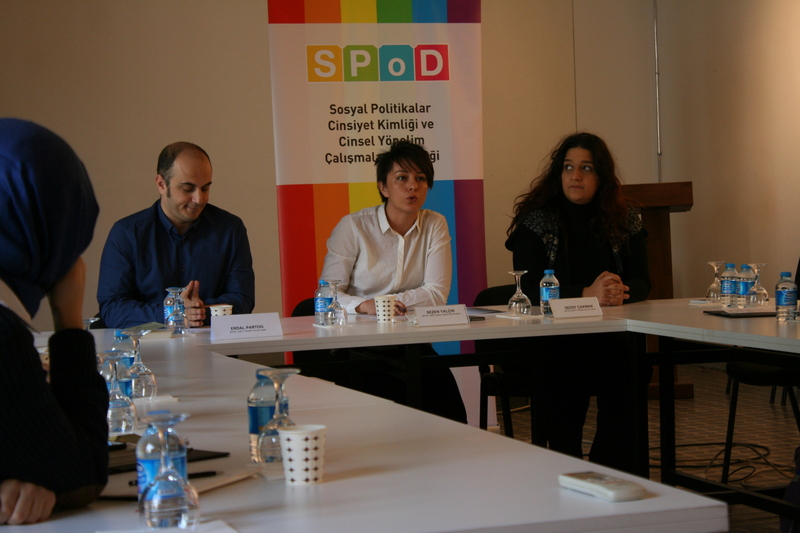 SPoD LGBTI’s Sezen Yalçın, Erdal Partog and Mehmet Akın explained the campaign, which will last until June, to Istanbul Co-President Ayşe Erdem. They discussed what SPoD LGBTI can do with HDP’s candidates for Istanbul within the scope of this campaign and the Party’s agenda for LGBTI rights in the election campaigns. SPoD Political Representation and Participation Coordinator Sezen Yalçın emphasized that the campaign would function independently from political parties and that this campaign serves to bring LGBTI rights to the parliament. HDP’s Istanbul Co-President Erdem said HDP supports LGBTI rights and declared that they will support SPoD’s campaign in Istanbul. In school, at work, in the parliament: LGBTIs are everywhere! LGBTIs have started a campaign called “In school, at work, in the parliament” leading up to the general elections. The details of the campaign designed for the active participation of LGBTIs in decision- and policy-making processes were shared at a press meeting on Tuesday, 24 February 2015. Social Policies, Gender Identity and Sexual Orientation Studies Association (SPoD LGBTI) believes LGBTIs will attain equal access to education, employment, housing, and health services when they are active politically. Therefore, SPoD LGBTI has started a campaign called “In school, at work, in the parliament: LGBTIs are everywhere!“ for the upcoming general elections. The details of the campaign designed for the active participation of LGBTIs in decision- and policy-making processes were shared at a press meeting on Tuesday, 24 February 2015. You don’t have rights if you are not present! Following the Local Administrations Political School for LGBTs that ran between 11 and 17 November 2013, the Social Policies, Gender Identity and Sexual Orientation Studies Association (SPoD) continue their work to increase the political participation of LGBTs and visit political parties. Following the meetings with the politicians of the Democratic Party of the People (HDP) in the HDP extraordinary congress in October, the SPoD and the representatives of LGBT Political Representation and Participation Platform met with the Republican People’s Party (CHP).